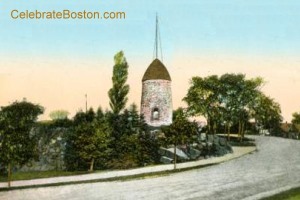 "The old powder-house is so named because at the outbreak of the Revolutionary War it was used temporarily as a magazine; but long before that it was a windmill. Here in the old days two lovers held their rendezvous; a sturdy and honest young farmer of the neighborhood, and the daughter of a man whose wealth bloated him with purse-pride. The father held a elitist opinion of the farmer, and when it was whispered to him that the young pair were meeting each other almost every evening at the windmill, he contrived to surprise and humiliate them at the mill as punishment. From the shadow of the door they saw his approach, and, yielding to the girl's imploring, the farmer hid himself while she climbed to the loft. The flutter of her dress caught the old man's eye and he rushed, panting, into the mill. For some moments he groped about, for his eyes had not grown used to the darkness of the place, and hearing his muttered oaths, the girl crept backward away from the stairs. She was beginning to hope that she had not been discovered, when her foot got caught in a loose board and she stumbled, but in her fall she threw out her hand to save herself and found a rope within her grasp. Immediately when her weight was applied to the rope, there was a whir and a clank; the cord had set the great fan blades in motion. Suddenly a fall was heard, then a cry, passing from anger into anguish. She rushed down the stairs, the farmer appeared from his hiding-place at the same time, and together they dragged the old man to his feet. At the same moment when the wind had started the blades he had been standing on one of the mill-stones, and the sudden jerk had thrown him down. His arm caught between the grinding surfaces, and had been crushed to a pulp. He was carried home and tenderly nursed, but he did not live long; yet before he died he was made to see the folly of his scheme, and he consented to the marriage that it had cost him so dearly to try to prevent. Before she could summon heart to set the wedding date, the girl passed many months of grief and repentance, and for the rest of her life she avoided the old mill. There was good reason for doing so, people said, for on windy nights the spirit of the old man used to haunt the place, using such profanity that it became visible in the form of blue lights, dancing and exploding about the building."